June 15 1909 -- Beulah Gunther was in the habit of allowing her telephone-less neighbors use her device. May Claussen, who lived in a neighboring boarding house, began to take too much advantage of Miss Gunther's largesse. When Gunther suggested that she'd like to have access to her own telephone on occasion, Ms. Claussen showed her with great force what she thought of that request. According to the article, Gunther emerged from the fight "minus a considerable part of a new shortwaist, eight long strips of epidermis and two handfuls of hair." Here's another Abe Martin postcard from the International Postcard Company. In case you're not up on your liquor terminology, a three finger drink is a straight shot that is as high on the glass as three stacked horizontal fingers. If you've got pudgy fingers, that can mean up to 2.5" toward sweet oblivion. In an effort to standardize things, I understand the finger measure has been replaced these days by one ounce per digit. Seems unfair to the fat-fingered lushes amongst us. Hearst assigned as his field marshal on this front, David E. Town. It happened that Town joined Hearst on my recommendation and despite some untoward influences set in motion by some of my associates. My friendship with Town began when he was general manager of the John C. Shaffer chain of newspapers in Indiana, Kentucky, Illinois and Colorado. It continued until his death in the ’30s. Town was engaged to carry out my suggestion that Hearst appoint a controller who would be in charge of mechanical, business and financial operations. He became one of my fellow members of the Hearst executive council. Town’s efforts to smooth the friction with the Associated Press directors proved abortive. A clash between him and Kent Cooper, the Associated Press general manager, stressed the crisis. This phase of the trouble grew out of a demand that I cease my endeavors to persuade publishers to withdraw from the Associated Press to become clients of International News Service. An issue of fact arose between Town and Cooper as to a discussion of my activities in that respect. An exchange of communications between them was tinged with acrimony. Town reported the receipt of a complaint from Cooper on November 11, 1926. It expressed Cooper’s conviction that none of my colleagues were aware of the insistence or extent of the International News Service raids upon the Associated Press membership. A memorandum from Town to the executive council outlined details of Cooper’s grievance. The State of North Carolina was cited as an illustration. There these members of the Associated Press had been solicited to desert that organization: Rocky Mount Telegram, Wilson Times, Concord Tribune, Henderson Dispatch, Fayetteville Observer, Goldsboro Argus, New Bern Sun-Journal, Wilmington News-Dispatch. Cooper added that two papers in the state—the Greenville Reflector and the Edenton News—had already been induced to resign from the Associated Press and to substitute Hearst services. He named as other newspapers that had withdrawn from the Associated Press “upon such solicitation” that year: Belleville (Ill.) News-Democrat; Yonkers (N. Y.) Statesman; Pulaski (Va.) Southwest Times; Charlottesville (Va.) Progress; Palatka (Fla.) Daily News. All this apparently constituted a very grave affront to the dignity of the Associated Press. 1. Consolidation of International News Service with the United Press can be effected on terms assuring substantial and continuing profits for both with guaranties as to quality of service for the Hearst papers and with reservations that will withhold from papers affiliated with the United Press any special or exclusive prestige or advantage. 2. Negotiations to this end should be pressed with the utmost speed consistent with secrecy and safety because better terms will be procurable so long as nothing is known of the quarrel between the Hearst organization and the Associated Press. If possible, an option for consolidation should be obtained in writing in Mr. Hearst’s favor within two weeks, to be exercised within six months. He will then be in superior position to deal with any situation that may arise with the Associated Press. 3. Immediate steps should be taken, to compose all misunderstandings between the Hearst organization and the Associated Press directors as to morning memberships. This should be possible without any real sacrifice on the part of Mr. Hearst. Adoption of a policy along these lines was urged upon Hearst by Bradford Merrill, Morrill Goddard and Victor H. Polachek. The recommendation was incorporated in a message wired over their joint signatures. Hearst answered immediately. His code telegram—with the usual signature, “Doctor”—was translated by Merrill at a meeting that I attended with Goddard and Polachek. It was a characteristic message. It paralleled Hearst’s abiding passion to play a lone hand. He had talked with the United Press people. They were fully informed about the situation. “Doctor” believed they were concerned chiefly over the prospect of International News Service building an organization too highly competitive to suit them. They had submitted a proposal to which he was evidently indifferent, though he had promised to resume its discussion in New York. A combination of International News Service with United Press would have produced an unrivaled organization. It could not have failed to affect the course of the world’s news-gathering history. 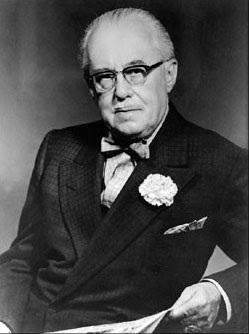 Its possibilities were destroyed at a meeting between Hearst and Roy W. Howard, head of the United Press. Hearst took umbrage at an unintentional affront. Howard told him he was not fitted to operate a news service. He believed Hearst’s dominating interest in his newspapers could not be subordinated to an interest in a news service. The purpose of the remark was certainly not invidious. But it nettled Hearst to such a degree that the negotiation collapsed. At that stage Hearst called up to the firing line a brilliant San Francisco lawyer, John F. Neylan, who held a membership in the Associated Press as publisher of the San Francisco Call-Post. Meanwhile, Hearst had decided to adopt a program submitted to him, at my instance, by my friend, Robert Ewing, publisher of the New Orleans States. This was a campaign to shear the strength of the cabal in control of the Associated Press. That clique, known as “the big six,” consisted of Adolph S. Ochs of the New York Times, Victor F. Lawson of the Chicago Daily News, Frank B. Noyes of the Washington Star, Charles H. Taylor of the Boston Globe, W. L. McLean of the Philadelphia Bulletin, and Elbert H. Baker of the Cleveland Plain Dealer. Their power was derived from the regulations by which directors were elected. There were approximately 1,200 members. One hundred owned forty bonds apiece, each entitled to 100 votes as against the single ballot of a mere stockholder. Thus less than nine percent of the membership enjoyed a balloting strength of more than 4,000 against the 1,100 to which the remainder of the association was limited. An intensive canvass directed by Neylan, with the assistance of Ewing and a group of so-called insurgents whom he rallied to the movement, resulted in the abolition of this oligarchic rule. The Associated Press was democratized. Every member was accorded an equal voice in the naming of the directorate. Hearst had mowed down the coterie that dominated the Associated Press. A composition of differences between Hearst and the chastened Associated Press directorate included a condition of which no member would have dreamed a year before. It was the surrender of a cardinal principle. While it involved only one locality, it proved how far a great institution may bend backward. When the Associated Press was left with a single outlet in Pittsburgh, and that a Hearst daily—the Pittsburgh Sun-Telegraph—a. troublesome snarl developed. As an Associated Press member, the Sun-Telegraph was forbidden to deliver news to a non-Associated Press agency. Because of a unique news-gathering situation in that region, neither the Associated Press nor International News Service could reasonably afford to forego the correspondence facilities commanded by the Pittsburgh Sun-Telegraph. Earnest consultations were held. Kent Cooper agreed that the Associated Press would be discreet enough to keep its eyes closed to practices that would otherwise be prohibited. But he failed to take into his confidence his Pittsburgh representative. An embarrassing complication followed. Cooper straightened it out with a special course in nictation. This was in amusing contrast with the attitude that Melville E. Stone maintained in a series of conferences with me a short time earlier. In our several meetings aimed at unraveling tangles between the Associated Press and the Hearst organization, Stone presented in great detail a list of grievances. The case on which he dwelt most insistently arose in Rochester, N. Y. There an employee of the Democrat-Chronicle had been under surveillance for weeks. He was a copy reader. His tour of duty ended at three in the morning. He was trailed nightly. The spotters reported that he went direct from his regular place of employment to the building in which was situated the Rochester office of International News Service. This practice was condemned by Stone in the severest terms. The man was being exposed to suspicion of a heinous crime. Concealed on his person—possibly in the recesses of his mind—might be news belonging to the Associated Press. What was his purpose, so burdened, in entering the edifice in which a competitive news service functioned? The implications were awful. They recalled the traditional penalty for disclosure of unprinted Associated Press news—blacklisting for life. It did not seem logical to me that responsibility should be impressed upon International News Service for the peregrinations of an employee of an Associated Press newspaper. There was a possibility that he was eking out his income with extra work for the Hearst bureau. If there were any obligation to determine that point, it did not seem to me to rest on International News Service. This was the weightiest of several questions that I failed to settle with “the grand old man” of the Associated Press. For the foregoing reasons, it is our opinion that the Associated Press is a combination organized for and engaged in the illegal restraint of trade, and that if proper proceedings should be instituted against it, it would be forced to dissolve. Although proceedings might be instituted merely to restrain it from the further employment in its business of the illegal agencies herein pointed out, the effects of such proceedings, if successful, would in our opinion ultimately result in its enforced dissolution as a judgment, that so important an organization as is the Associated Press was organized and operating in violation of law, could hardly be ignored by the Department of Justice. Upon such advice, judgment was reached that the millions of dollars represented in the memberships owned by Hearst would be exposed to too great a hazard by the institution of any suit attacking the validity of Associated Press regulations. The handicaps imposed by deference to Hearst’s Associated Press complications did not deter either International News Service or Universal Service from setting new records in their field. Universal was the first agency to adopt automatic printer telegraph machinery as its exclusive means of transmission. It was the first to establish in America a transcontinental automatic printer circuit. These innovations were installed by Chester R. Hope, editor of Universal Service, whose vigorous enterprise contributed greatly to the efficiency of my executive staff. Under Hope's direction, Hollywood and New York’s “Four Hundred” made their joint debut as daily telegraphic features. Louella Parsons and Cholly Knickerbocker (Maury Paul) were starred on the same coast-to-coast line. International News Service performed a historic feat in the sending and transcribing of news by radio. The potentialities of this pioneer achievement have yet to be measured. Its first public demonstration was made at the American Newspaper Publishers’ Association convention at the Waldorf-Astoria Hotel in 1924. In room 1590 of that hostelry, journalists gathered from day to day for a week to watch a typewriter capture from the air and transcribe a complete news report at the rate of sixty-five words a minute. It was the International News Service High Speed Automatic Radio Printing System. It was the result of more than three years of experimenting. The inventor was William George Harold Finch, afterward recognized as one of America’s leading radio engineers. 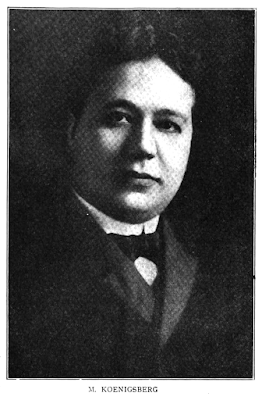 Finch was an insurance company inspector of wireless sets in Buffalo in 1921. I was combing the country for an instrumentality with which to push International News Service ahead of its competitors. The search had been suggested by the pyrotechnic advances in wireless. Word reached me of a relay invented by Finch. A week later he was installing a laboratory in the offices of King Features Syndicate. Lieut. Col. Archibald M. Stevens and William A. Bruno were engaged as his collaborators. After a series of successful tests covering many months, the cooperation of the Federal Wireless and Telegraph Company of California was enlisted. Rudolph Spreckels, the managing director, brought the president, Ellery Stone, to New York to confer with me. Spreckels agreed to join the Hearst organization in the erection of three powerful wireless stations to blanket America. The commercial facilities were to be used by the Federal Wireless and Telegraph Company and the news channels by International News Service. Hearst showed keen interest. His executive council opposed the project. Meanwhile, my friend, R. R. Govin, now the owner of four dailies in Havana with circulations exceeding those of all the other newspapers in Cuba, expressed eagerness to associate himself with the undertaking. A meeting was held on Hearst’s yacht. Spreckels, Govin, Arthur Brisbane, Bradford Merrill and Louis B. Eppstein, counsel for King Features Syndicate, attended. It was Brisbane who devised a way to overcome the objection raised by the executive council. He suggested that Hearst and Spreckels share equally in the underwriting. Both assented. It was agreed that a total investment of $1,750,000 would suffice. Spreckels and Stone brought a staff of technicians to New York. More than twenty men busied themselves in a New York hotel suite perfecting details of the organization. Their task was being completed when Hearst telephoned me. He wanted me to meet him at the office of Martin Huberth, manager of his New York real estate operations. It was a spot suited for privacy. Showing more embarrassment than I had ever noticed in him, Hearst called off the deal with Spreckels. He explained that his financial advisers had counseled against it. Not long afterward Spreckels sold the Federal Wireless and Telegraph Company to the Postal Telegraph Company for $20,000,000. That did not underline the wisdom of the advice Hearst had accepted. At that moment a page summoned me to the telephone. Clyde West, night manager of Universal Service, was on the wire. In the excitement that possessed him, his sense of values was upended by an enthusiasm for his calling. The order in which he stated the facts of his message is unforgettable. He was a newspaperman whose work was more important than the world’s history. “Boss,” West’s voice came in shrill contrast with his customary drawl, “we’ve just scored an eight-minute beat on the death of the President.” Then, without waiting, he went on to tell how James R. Nourse, the Universal Service correspondent accompanying the presidential party, had come in first. Nourse’s room was on the same floor as Mr. Harding’s quarters in the Palace Hotel in San Francisco. He was on the way to the elevator when a slight commotion attracted his attention to the presidential suite. He was at the door before the doctor had announced the tragic news. West was still on the telephone when a recollection of Charlie Powers’ weird prediction gave me a start. And then even that strange coincidence faded into a commonplace beside the phenomenon which had enabled such a person as Fred Mayer to apprise me of an historic event. In one stroke, providence had sliced apart the chief domain of the Fourth Estate. The radio had come to share the primacy of the press in the world’s greatest cultural function—the dissemination of current intelligence. 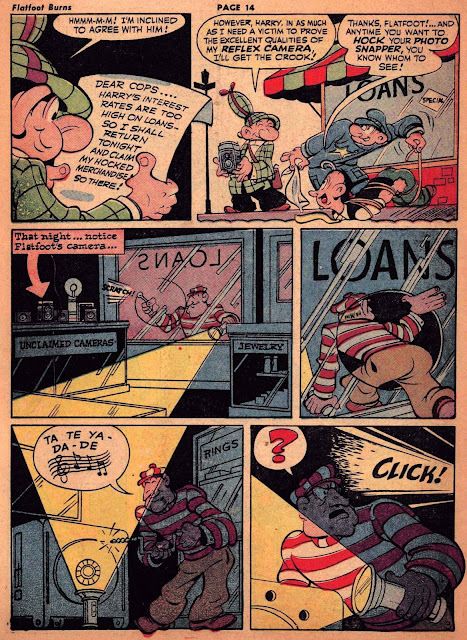 When Al Capp's Li'l Abner became an almost overnight hit for United Feature Syndicate in 1934, they requested that Capp create a Sunday page to accompany the daily. The Sunday started about six months after the daily, debuting on February 24 1935. Capp needed to come up with a topper strip to accompany Li'l Abner, and the result was Washable Jones. 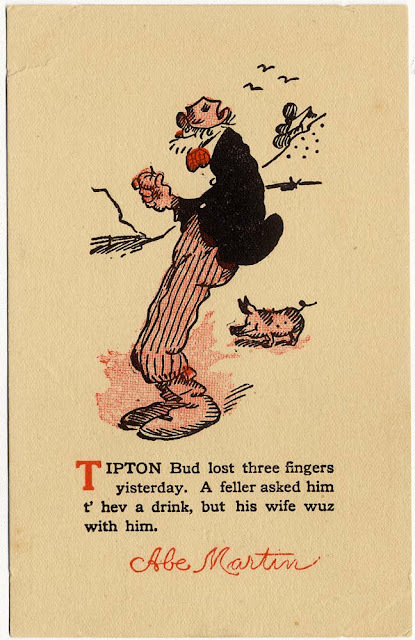 This topper appeared only in the full and tab versions of the strip; in halfs there was no topper included. In this series Capp used the same familiar hillbilly milieu to tell a fantasy about a boy who gets into fantastical adventures. The strip definitely had a dashed-off quality to it, and Capp presumably wasn't satisfied with what he'd come up with. He also probably wanted more room to develop his Li'l Abner Sunday stories. 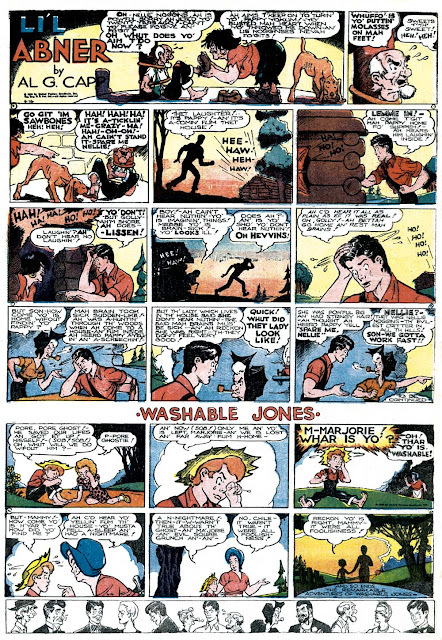 That meant jettisoning Washable Jones after a mere four months, who's adventures turned out to just be a dream on the final Sunday of June 16 1935 (sample above). The next week Li'l Abner gained another full tier of panels plus a page-wide title panel. The only remnant of a topper was a small panel cartoon titled Advice fo' Chillun, which we'll talk about some other day. Alvin Lester “Al” Stahl was born on July 3, 1916, in Yonkers, New York, according to his Social Security application that was transcribed at Ancestry.com. His parents were Jessie Stahl and Helen Mandell. In the 1920 U. S. Federal Census, Stahl and his parents resided in the Bronx, New York at 933 Tiffany Street. The trio were in the household of Jacob Lory who was the uncle of Stahl’s father, a real estate broker. Lory was married with three children. Stahl, his parents and brother, Irwin, lived in Atlantic City, New Jersey at 364 South Virginia Avenue in the 1930 census. Stahl’s father was a furniture merchant. Stahl graduated from Atlantic City High School. 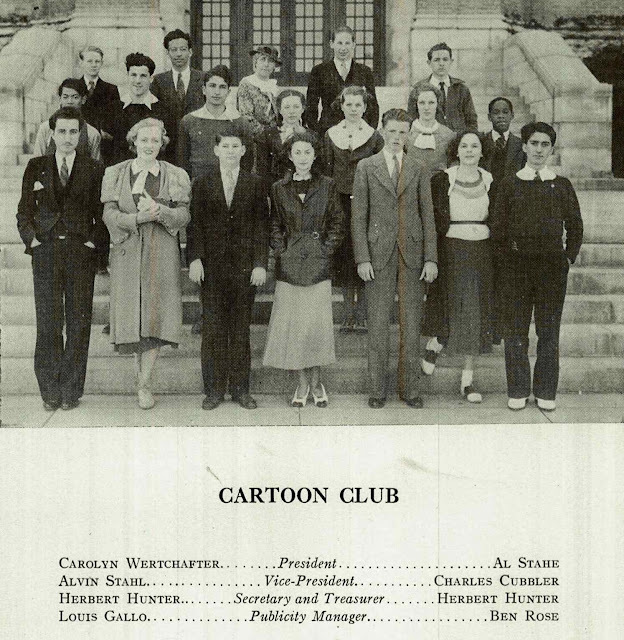 The 1934 Herald yearbook published Stahl’s senior photograph and group photograph of the Cartoon Club. Stahl is in the front row, third from the left. Information about Stahl’s art training has not been found. In 1934, Stahl wrote and illustrated the 68-page book, The American Course of Cartooning for the American School of Cartooning. that was based in Chicago, Illinois. The book was advertised in many publications including Popular Mechanics. Stahl copyrighted a few projects. The Catalog of Copyright Entries, Part 4, Works of Art, Etc., 1936, New Series, Volume 31, Number 1, had an entry for Stahl’s Needles followed by Stahl and Richard Mackay’s Al n' Mac. Another entry for Needles was in the Catalog of Copyright Entries, Part 4, Works of Art, Etc., 1936, New Series, Volume 31, Number 3. Happy Trailings was included in the Catalog of Copyright Entries, Part 4, Works of Art, Etc., 1936, New Series, Volume 31, Number 4. The Catalog of Copyright Entries, Part 1, Books, Group 2, 1937, New Series, Volume 34, Number 3, had Stahl’s Trailer Family. Who’s Who of American of Comic Books 1928–1999 said Stahl was an animator at Terrytoons and Famous Studios in the 1930s. At some point Stahl worked at the Fleischer animation studio. In Alter Ego #12, January 2002, Gill Fox said he met Stahl at Fleischer’s which was located at 1600 Broadway. Near the end of 1938, the studio moved to Florida. Stahl produced material for Malcolm Wheeler-Nicholson. The New York Times, July 1, 1939, said Stahl had a $334.20 judgment, filed in Nassau County, against Wheeler-Nicholson. The 1940 census said Stahl was a commercial artist residing at 103 West 91 Street. It’s not clear why Stahl told the enumerator he was born in Switzerland. 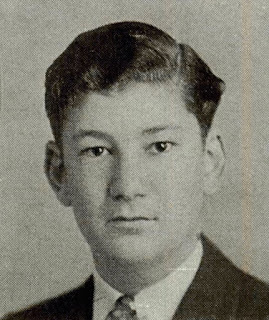 During World War II, Stahl enlisted in the army on September 4, 1943. Fox recalled how Stahl shorten his army service. He said, “I was, but I got out. I figured it out. Because of my background, they put me in the Signal Corps. You have to climb poles. So I got to the top of the pole and yelled out, ‘I can’t move! I’m afraid! I can’t move! I can’t come down!” They had to go up and take him down. “It worked!” It was typical Al. He was a helluva cartoonist. And he’s still working! He’s kind of nuts and a lot of fun. A great cartoonist who knows how to make a buck. Anything he does is good. And he wrote his own stuff. 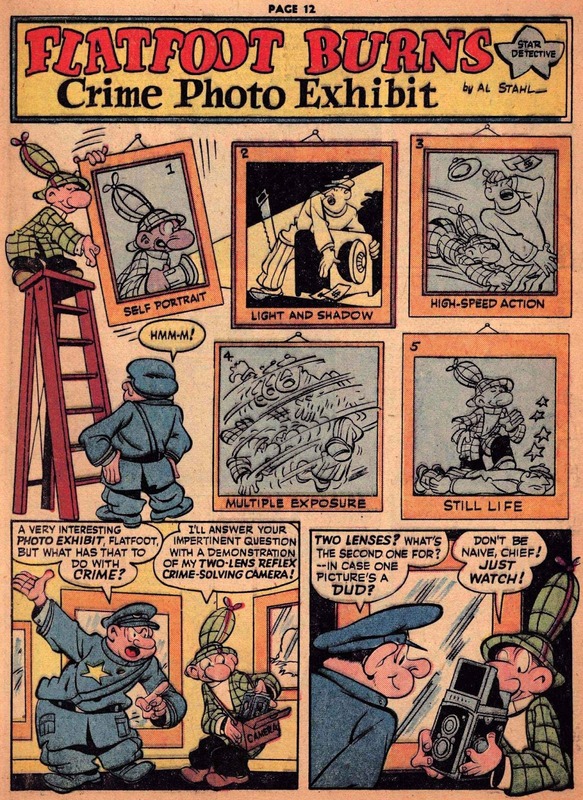 Fox chose Stahl to draw Flatfoot Burns, Star Detective, that appeared in The Spirit comic book newspaper insert. 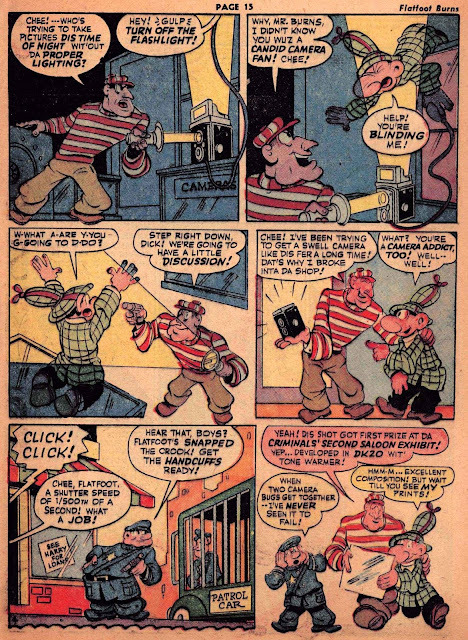 American Newspaper Comics (2012) said the back-up feature ran from May 6, 1945 to November 3, 1946. On January 29, 1944, Stahl obtained a marriage license in Manhattan, New York City. The name of the bride is not known. During the 1940s Stahl worked for several comic book publishers. Who’s Who said Stahl used the pen name Bruce Baker on stories that appeared in Ding Dong and Frisky Fables. There was a comic book artist with that name according to the Utica Daily Press (New York), April 3, 1946. The newspaper identified some of the contributors to the Rhoads General Hospital publication, Mohawk Rhoadsman: “Among the reporters, photographers and artists who worked for The Mohawk Rhoadsman were: …T 5 Bruce Baker, comic book artist…” There were at least nine comic book stories signed “Bruce Baker”. It’s not clear what role Stahl had in those stories. In the 1950s Stahl left comics and turned to animation. Business Screen Magazine, March-April 1951, published a list of regional film companies. Stahl was in charge of animation at American Film Producers, located at 1600 Broadway. In 1952 Stahl and his brother, Irwin, headed up Animated Productions, Inc., also at the same address. Stahl was in animation for over 35 years. Stahl passed away December 10, 1999, in New York. He was laid to rest at Calverton National Cemetery. He looks half-Asian. Was that mentioned nowhere in the records? I think things like that should be honoured. Stahl’s paternal and maternal grandparents were Austrian. Austrian and Hungerian have Monogolain dna in their anestry. For many years throughout the 1970s and 1980s, Al took out small ads in film trade publications, notably Business Screen, that read; "Al Stahl Animates Everything". The ads promoted his free lance animation business. Al was my grandfather. He was not half asian or anything, he was a German Jew... If his grand parents were from Austria I haven't really heard abut it. I think that maybe one of his grandparents was from Austria, but the records I've managed to scrounge up are a bit contradictory. Here's a funny story my dad told me: Al went to New York to pursue a career as a cartoonist. When he finally found a place that was hiring, there was a gigantic line in front of the place, (I think it might have been Terrytoons) as it was during the Great Depression, and he didn't want to wait. Instead, he snuck in through a back window and started drawing on the first sheet of paper he could find. When someone finally came down and saw him, they said, 'who are you and what are you doing?!' and Al said that he was there for the job. The guy looked over his drawings and told him that it was very good, but they already hired a guy. However, if Al wanted, they would have him work for free and give him the next job that came up. So he accepted, and after a couple weeks of working for free he got hired. Can anyone confirm the rumour that Al produced the opening animation sequence for The Phil Silvers Show aka Sgt Bilko, 1955? Many thanks. 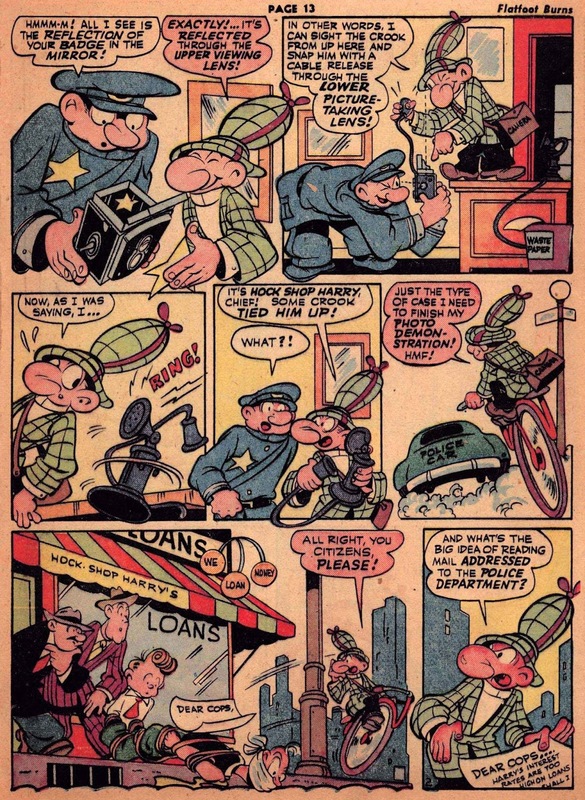 Flatfoot Burns Star Detective was created for Quality Comics by Al Stahl in 1943. It first appeared in Police Comics #19, and ran there irregularly into 1946 issues. But that's not why we're talking about it here on Stripper's Guide, of course. No, it's because this fun but unassuming little backup feature was chosen by Will Eisner to hit the big time as a backup feature in his syndicated Spirit section. As far as I know, this was the only time that Al Stahl's delightful rubber-boned artwork would appear in newspaper syndication. However, Alex Jay's Ink-Slinger Profile, which will run tomorrow, found a number of possible newspaper series listed in copyright records. In the Spirit section, Flatfoot Burns was a four-page feature that replaced Intellectual Amos by Andre LeBlanc. According to my indexing of the Chicago Sun, the first Flatfoot Burns story appeared in the issue of May 6 1945. The Grand Comics Database, on the other hand, claims that the switch happened with the issue of June 24. Who is right? I dunno. Maybe my indexing was faulty, or maybe the GCD is a little confused. I can't recheck the Chicago Sun microfilm without a 2000-mile trip, and as far as I know it is not available digitally. At least we agree on the last appearance, which was on November 3 1946. This was when the Spirit section was reduced from 16 pages down to 8 pages. I'd like to give credit for the scan of the story above, but I found it shared through a site that collects images from other websites (including mine *harrumph*) and offers no credits or back links. That's just not cricket, whoever you are.